Grey clouds had begun to gather over the Lagos business district Alausa as Nahimah alighted the black-striped yellow bus that had transported her from Opeloru Estate in Ikorodu. Attentive to the unpredictable traffic on Mobolaji Johnson Avenue, she carefully crossed the road. Her destination, the recently constructed Ndubuisi Kanu Park, lay just ahead. She went past the entrance casually manned by two security guards and did a quick scan for a suitable spot where she could take photos with little or no interruption. An intersection of three roughly tiled walkways caught her eye. She arrived at the spot, took out a phone from her bag, launched the Street View app and began. About 30km away in Amuwo Odofin, another sprawling Lagos suburb, Funmi was just leaving her project. Hers wasn’t quite a walk in the park. She had found it more difficult to gain access to the compound of Anori Ajeromi Junior Grammar School where a new block of classrooms built by the government was standing. The guards here were more alert and she had to provide a credible reason for her apparent intrusion. After several rounds of capturing photos at different strategic positions, she felt her job was done. 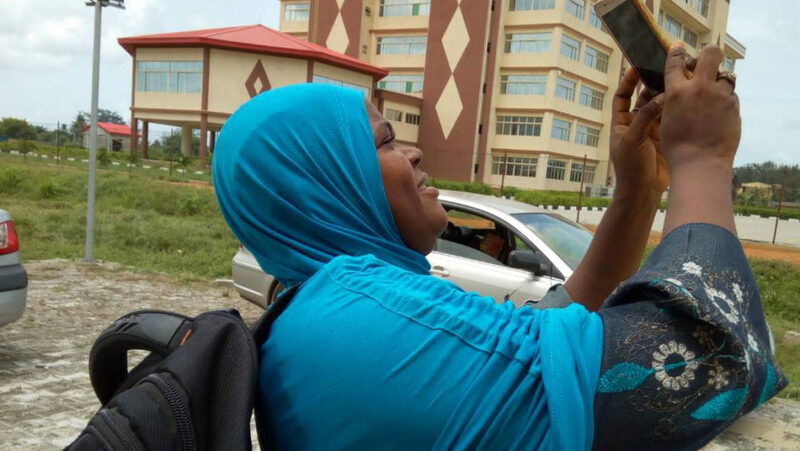 Nahimah and Funmi, along with Sodiq in Badagry, Bukola in Alimosho and several others are part of a team of journalists who were recently involved in image-capturing some of the developmental projects in Lagos using geo-mapping technology. Their aim was to make those projects accessible on Google Maps as part of an advocacy initiative for more data disclosure around public contracts in the city. Big city, big projects…no data? Indeed, the proliferation of capital projects in Lagos is immense. At first thought, this is perhaps not too surprising: Lagos is the largest city in Nigeria; it is ranked among the ten most populous in the world with an economy that would be the sixth biggest in Africa if it were a country. Yet, moving through sites in suburbs like Oshodi and CMS stirs wonder and questions: how much it must cost to transform such a city! Giant cranes and forklifts are picking and placing beams of curious shapes and sizes, burying some deep into the seabed, and erecting others as support to ground structures under construction; while a multitude of people is going about their everyday business on the streets and at bus stops. In those places and some other parts of Lagos, billions in naira are pouring into developmental projects which the state government believes will transform the metropolis into the mega-city it has craved for the best part of the last decade. While the dimensions of the projects rouse wonder, many of the questions that follow usually remain unanswered. Accessing data on public contracts in Lagos state, from origin to implementation, is like looking into an immense black hole. Billions of naira change hands from ministries, through banks to contractors, but not many residents or civil servants in the state can adequately describe with certainty the details of these projects. The people of Lagos are expected to have confidence in the goodwill of the elected authority; considering the vast number of developmental projects in the state, perhaps there is a reason for them. However, such confidence cannot be sustained if information about their contracts continues to be inaccessible and shrouded in apparent secrecy. Because in public contracting in Lagos not disclosed, citizens can’t evaluate the true utility of their taxes. While there is a sense of the government being at work, the scarcity of details concerning public service delivery gives little to no idea about the fairness, equity, and competitiveness of the procurement process – or their lack thereof. How do citizens know the best contractors get the right jobs? How much exactly is paid and for what period? How are projects prioritized by the state government? What constitutes a good project? Because every law-abiding responsible citizen of the state makes contributions that are valuable to its progress, there is a need for data on public procurement to be accessible to citizens in forms that are comprehensible, usable and actionable. For us at the Open Data Research Centre of the Pan-Atlantic University, the obvious remedy is, well, open data. But before proffering a solution, we considered two factors. On one hand, with elections on the horizon, disclosing data openly about its procurement process would enable the Lagos state government to prove that transparency is high on its agenda. On the other hand, while every group of citizens in the state possesses the capacity to utilize procurement data to a certain degree, it is to journalists – the communication bridge between the government and their people – that the value for accessibility of data is arguably most essential. It is the duty of journalists to obtain, understand, analyze and transmit information on public procurement to the people of Lagos to foster robust and progressive conversations about how public monies are used. Unfortunately, this has not been an easy task. 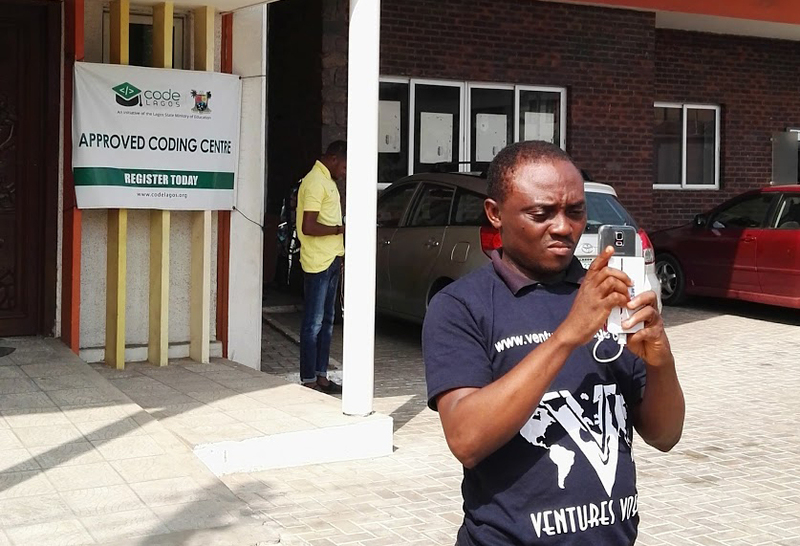 Apart from obvious difficulties in obtaining granular, editable and open data from Ministries, Departments and Agencies in the state, conveying stories to the public based on data has not been as effective as it could be. In part, this is because, journalists say, they don’t have the skills required to make sense of data whenever it is available. The consequence is that the public, more often than not, receives reports from journalists on public procurement, but quickly move on. Without a direct emotional connection made between the data and the impact of government projects in communities, the public has, over time, learned to tune out, interpreting them as mere press releases handed down from government agencies to journalists. Apathy and civic disinterest usually flow from this lack of evidence-based breakdown of data to the public, thereby encouraging the cycle of public sector corruption and sub-optimal governance. Our solution to this challenge has been twofold: first, to teach journalists about the principles of public and open contracting and, second, to show them how to work with contracting data. From our point of view, while the former will help their understanding and appreciation of the value of openness, transparency and participation in the public procurement process, the latter will equip them in the task of advocating for it through insightful and evidence-based storytelling. The logic is simple. Through data-driven investigative reporting as well as innovative technology, journalists can convince the Lagos state government to proactively disclose procurement data while, simultaneously, igniting public interest in it. This way, the media can serve as a primary channel of social accountability – just as it should be. Now, Nahimah and her journalist colleagues are playing their role in this process. Having participated in our two-day workshop focused on open contracting, they have embarked on the drive to sensitize the public about contracts in Lagos and, specifically, about the paucity of data around them. They have published their Street View images on Google Maps which we collated to form the building blocks of an interactive online survey targeted at Lagos citizens. The survey aims to assess how much citizens know – and would like to know – about key contracts in the state. The results of the survey, still ongoing, will serve as feedback for the Lagos government and useful fodder for meaningful data analysis and insightful storytelling that the public can truly connect with. As far as procurement data is concerned, we hope that this project will catalyse a breakaway from the status quo in Lagos. But it is only a beginning. Our aim is to prepare a path for journalists to continue re-assessing and reinventing their communication to the public especially on issues of public procurement, governance and contracting. In this way, civic interest and social accountability will be illuminated by evidence-based data storytelling which will become the norm. When these parts effectively come together, the government will respond to the public’s awareness and greater interest in transparency, accountability and openness in public contracting, thus reducing corruption and making governance beneficial to all. This will be the Lagos, the mega-city, desired by pedestrians using bridges at Cele and Ojodu Berger, vehicle owners who drive past toll gates in Lekki and Ikoyi, as well as parents whose children attend public schools in Alimosho and Festac. And there is every reason to believe it is possible to achieve.